Is there evidence we should “teach the controversy” of evolution? More than a decade ago creationists tried to get their pseudoscience into American public schools on the grounds that teachers should “teach the controversy about evolution.” They were rightly defeated. Now, they’re arguing the evidence actually supports their position. Why they were so eager to promote it before this evidence came to light, I don’t know. But now, the folks over at Evolution News and Views are claiming teaching the controversy is the better way to teach science. The argument comes as part of a review of the Smithsonian’s travelling human evolution exhibibition. ENV are absolutely livid that their creationist views don’t get a mention in the exhibit. They go on to claim that they should be included because it helps science education. Tehir evidence for this is a 2005 study by a researcher called Stephen Verhey’s they say shows “teaching the controversy” helps educate people. Despite being from 2005, this is the first reference I can find on their site to this research. But just because it’s old and ignored doesn’t mean it’s untrue. Is there really evidence that we should teach the controversy about evolution? Verhey’s work does actually find some support for not ignoring “the controversy”. However, it isn’t simply the case that including “the controversy” is a benefit. What Verhey is doing is trying to connect the class to their prior experiences on the subject. Since it was an American class, much of the prior experience with evolution is “the controversy”1. Studies in other culture have found similar results. But in those cases, you have to connect it to whatever prior learning present in that culture. A study similar Verhey’s was conducted in Thailand where prior learning about evolution is less confrontational. Instead, evolution was more often talked about in the context of fitting with religious ideas. In this case teaching from that point of view, rather than “the controversy” proved most effective2. This doesn’t just apply to evolution. Engaging with prior knowledge and teaching from examples students are familiar with have been shown to be effective methods in many subjects3. In other words, the key is engaging with students on their level. Sometimes, but not always, this may involve a bit of “teaching the controversy”. But that’s just a starting point to get people connected. All of this is somewhat a moot point as the creationists aren’t advocating for this method, however effective it might be. Instead, they’re citing it as evidence that we should teach “both sides”. Nowhere in Verhey’s paper does he provide any support for the effectiveness of “teaching the controversy”. Again, his point is that it can be a way to connect with students. Once this groundwork is done the controversy must be done away with. He repeatedly states that creationism must eventually be soundly refuted; albeit, in “respectful, matter-of-fact way”1. That doesn’t sound very “both sides” to me. In other words, they’ve found research which they think supports their position and are trying to twist and cram it into their existing conclusions. They don’t really understand it and it doesn’t actually say what they think it says. Which I find a wonderful microcosm of their attitude to science in general. Their bad thinking permeates everything they do. Verhey, S.D., 2005. 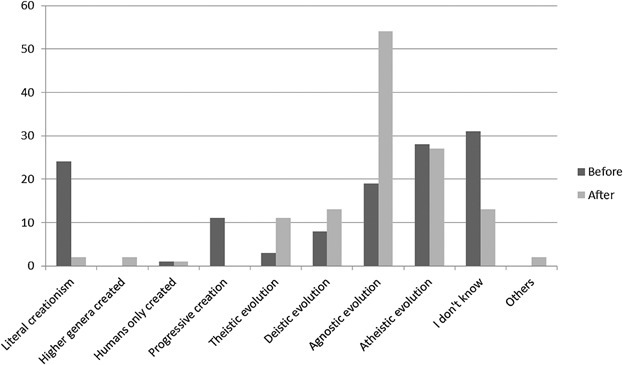 The effect of engaging prior learning on student attitudes toward creationism and evolution. BioScience, 55(11), pp.996-1003. Yasri, P. and Mancy, R., 2016. Student positions on the relationship between evolution and creation: What kinds of changes occur and for what reasons?. Journal of Research in Science Teaching, 53(3), pp.384-399. Pobiner, B.L., 2012. Use human examples to teach evolution. The American Biology Teacher, 74(2), pp.71-72. In my view Darwinists are just as guilty, if not more so than what you would refer to as creationist cults, facts and evidence are being ignored, which is hardly science. A few hours reading PCN magazine http://pleistocenecoalition.com/ (A science publication) should enlighten you to the hypocrisy. Yes and my own work empowers almost everyone to disprove the timelines suggested for human evolution by scientists, check my prove it yourself post, A preliminary test can be achieved in gravel drive ways (ochre/iron stained gravel works better for fairly obvious reasons). Real scientist should be knocking down my door, or searching gravel deposits for this easy to find evidence, there not, it destroys the paradigm, so they ignore it. The PCN are late with the May edition of their news letter. I think it would be highly beneficial if American students were taught ab out the origins of the Bible – the current consensus is that the Book of Genesis dates from around 45-350 BC and that the creation account could possible be later still, from Hellenistic times. I doubt that religious Americans would like this, but we could at least teach the controversy (although actually there is no controversy regarding these dates). 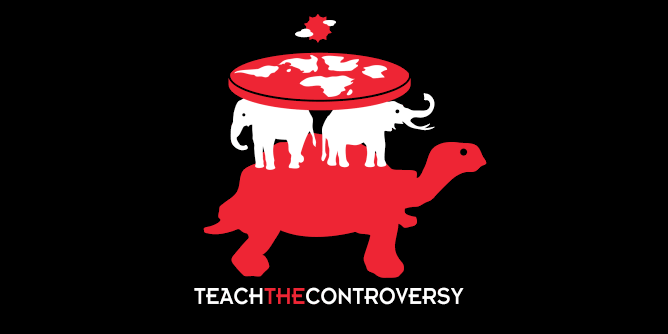 Well, then we should teach the controversy. Is it a 2300-year-old book or magic? They have some great shirts. As well as being funny, they highlight one of the reasons that some of the educators I cite dislike “teach both sides”. Namely, that evolution is the only theory that would happen for. They’re concerned that this alone would be enough to bias students and influence their views.